To enroll download registration form or contact us. 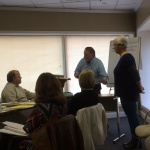 All courses are approved by the Tennessee Commission on Alternative Dispute Resolution for Tennessee Supreme Court Rule 31 Listing and Continuing Mediator Education. All courses are approved continuing legal education by the Tennessee Commission on CLE and Specialization and by other state governing agencies as requested. 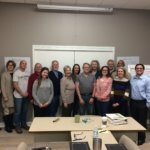 The Tennessee Supreme Court approved courses conducted by Private Dispute Resolution Services are a comprehensive learning experience that provide professionals with mediation training necessary to apply for Tennessee Supreme Court Rule 31 General Civil or Family mediator listing. The professionals who take these courses are also looking to enhance their problem-solving skills with co-workers and constituents and become better advocates for their clients when disputes arise. This is just the first step for many in becoming mediators and/or learning alternative methods of dispute resolution. Each of the participants comes to this training with valuable communication and problem-solving skills. Our role is to help them hone those skills and incorporate them in to a formal collaborative problem-solving process. We are so proud of what this group accomplished, said PDRS Instructor Terry Croghan, This is a hands-on training with ongoing evaluation and everyone stayed engaged and contributed 100%. That always makes for a great educational experience. 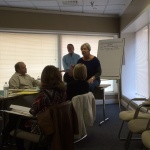 Our Next Mediation Training Institute will be held April 11-15, 2016. For more information about PDRS mediation training and services, contact us. James Woods knows the power of apology. The intense, versatile actor, known for roles in such films as “The Onion Field” and “Ghosts of Mississippi,” had no intention of even talking to representatives of Kent Hospital in Warwick, R.I., which he and his nephew had sued in the death of his brother Michael. But a “change in rhetoric” that included a heartfelt apology from hospital President Sandra Colletta ended his determination not to settle. The result, besides better feelings between the parties, was a financial agreement taking care of his brother’s children and a promise to create a patient safety institute in his brother’s name. Apology and disclosure are making headway in legal disputes — or even before a legal dispute has arisen. In the Woods case, the apology came in the lawsuit involving Michael Woods, 49, who died of a heart attack after being admitted for a sore throat and vomiting. A doctor testified that she ordered that he be put on a heart monitor, but that never happened. Testimony indicated Woods was on a gurney in a hospital hallway for more than an hour when he had his heart attack. But apologies are not just limited to medical malpractice cases. University of Illinois law professor Jennifer Robbennolt has done a series of studies that show apologies can help resolve legal disputes in cases ranging from medical malpractice and divorce and custody to disputed dismissals and personal injury. “Conventional wisdom has been to avoid apologies because they amount to an admission of guilt that can be damaging to defendants in court,” says Robbennolt, who surveyed more than 550 people about their reaction to apologies offered during settlement negotiations in a hypothetical injury case. “But the studies suggest apologies can actually play a positive role in settling legal cases. Victim Offender Reconciliation Program of the Central Valley, which practices restorative justice. But, she adds, they need to be sincere. “If the offender is not remorseful, we don’t want to revictimize the victim.” Apologies are used in cases from vandalism to theft to battery, Daoudian notes, and young people who go through the process have a lower recidivism rate than those who don’t. Eureka attorney/mediator John Gromala says “an apology helps change the tenor of discussion,” and he has seen it work in right-of-way disputes, real estate transactions, partnership disputes, estate litigation, management team dysfunction, hostile work environment and estate planning. “Apologies have had significant impact in mediations I have conducted involving many different matters,” he says. Still, the widest use to date of apologies in legal disputes involves medical malpractice. Some California hospital groups, including San Francisco-based Catholic Healthcare West (CHW) and the Los Angeles Veterans Administration, adhere to a policy of full disclosure, which means that “adverse events” are acknowledged and investigated. Hospital officials will make an apology if it’s warranted and in some cases offer compensation. Even if an apology is not due, the medical care team will make an effort to empathize with the patient’s concerns. Stanford University Medical Center has a variation called Process for the Early Assessment and Resolution of Loss. “It’s just the right thing to do,” says Barbara Pelletreau, vice president of patient safety and clinical risk management at CHW. According to a document about the healthcare system’s philosophy, “CHW is committed to full and timely disclosure in a manner that expresses our values and fair compensation to a patient or the family by the responsible parties, whether that is CHW, one of our partner health care providers, or both.” The values to which the document refers are dignity, collaboration, justice, stewardship and excellence. Dr. Lester Jones, a dean and professor at Western University of Health Sciences College of Podiatric Medicine in Pomona, is “a very big advocate of disclosure.” As associate chief of staff for 10 years at the VA Greater Los Angeles Health Care System, Dr. Jones created the disclosure program there and organized the meetings with patients and their families to explain what had happened. A discussion may have to do with bedsores, loss of life or limb or near-misses like how a nurse stopped just short of dispensing the wrong medicine or how a doctor determined that he was about to operate on the wrong cataract. The goal of the apology was not to prevent lawsuits, Dr. Jones emphasized. It was to do what’s right, and being honest with the patient goes hand in hand with the aim of openly acknowledging mistakes so safer procedures and systems can be created. “We were realizing there were a lot of medical misadventures taking place at the VA and we knew something needed to be done,” Dr. Jones says. Carol Bayley, vice president of ethics and justice education for CHW, warns that there’s a big difference between disclosure and apology. “You have to be careful you don’t apologize for something you didn’t do.” That doesn’t mean health officials have to refrain from empathizing if something goes amiss and they don’t believe it’s their fault. California is one of 35 states that has a version of the “apology” law, which holds that apologies are inadmissible as evidence in court. However, “I’m sorry for what happened” is not the same as “I made a mistake,” and an admission of responsibility is admissible. When responsibility does lie at the feet of the doctor, nurse or some other healthcare official, not just any apology will do. “If it’s scripted or if it sounds like some lawyer wrote it, I promise you, the family won’t bite,” says Doug Wojcieszak, founder of the Sorry Works! Coalition, an organization that promotes disclosure, apology and upfront compensation when warranted. “When something goes wrong to upset the patient or upset the family, the first thing to do is empathize: ‘I’m sorry this happened; we’re going to investigate.’ Even if you don’t think you made a mistake, empathize.” If the investigators find that the medical practitioners were at fault, “go back to the family and apologize.” Even if no fault is found, he recommends explaining the investigators’ findings to the family. CHW representatives say they don’t know if lawsuits have decreased as a result of disclosure, but others who have adopted the policy say it has made a difference. The University of Michigan Health System reports that malpractice claims against its system fell from 121 in 2001 to 61 in 2006. Average time to process a claim decreased from 20 months to eight months and costs per claim were half as much. The VA Medical Center in Lexington, Ky., the pioneer in full disclosure, reported that in a 13-year period, the facility went to trial only three times and negotiated more than 170 settlements, the mean cost being $36,000 compared to $98,000 pre-trial, $248,000 at trial and $413,000 malpractice judgments at VA hospitals nationwide. On the other hand, a survey of legal, risk management and healthcare officials by a group of Harvard researchers led by David Studdert found that there was a 95 percent chance that total claim volume would increase with full disclosure policies.